There are not that many ergonomic keyboards with integrated touchpads. This is one of them. If you need a full-sized keyboard with an integrated touchpad, check out the Adesso Tru-Form. You get a 105 Keys extended keyboard, 8 hotkeys, a number pad, Windows Power Keys, Multimedia, and Windows Hotkeys. The touchpad comes with left/ right click buttons. In terms of ergonomics, you get a split keyboard design with an integrated palm rest and a sloped shape to encourage a more natural hand position while typing. The shape will not require any significant retraining on how to type. 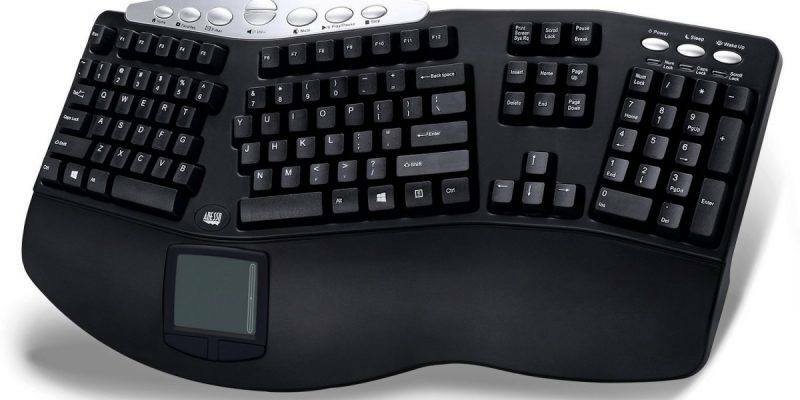 In other words, if you have never used a split keyboard before, switching to this model will not slow you down much initially, and within a day or two, you will be back to full typing speed. This is a USB based keyboard that is designed for Windows. This keyboard works fine on a Mac expert the function keys do not work. You can get third party software that may be able to map these function keys to Mac function keys. Linux and Chromebook users can also use this keyboard, though like the Mac the function keys may not work, and the multimedia keys will likely not work. It would be awesome if this keyboard had adjustable feet so you can further tune the best angle for you. Not a bad deal for a keyboard! Check the latest pricing for an Adesso Tru-Form keyboard.